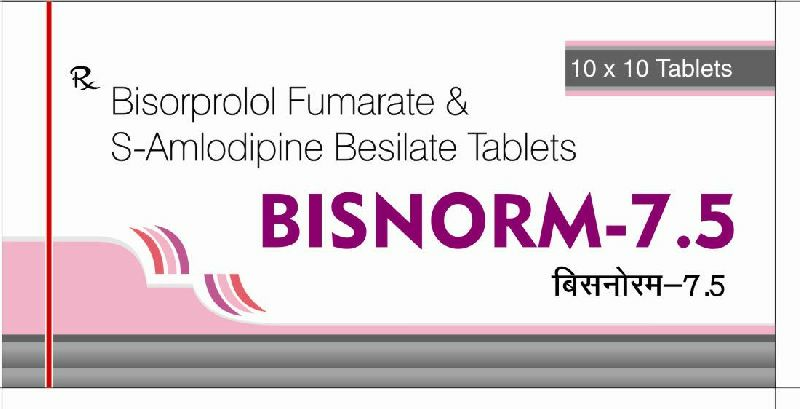 BISNORM-7.5 is a combination of Bisprol 2.5mg & S-Amlodipine 5mg. Bisprol is a drug belonging to the Gnwp of Beta Blockers a class of medicines used for Cardio Vascular Disease. It is selective type B1 Adrenergic Recap for Blocker. Bisprol is beneficial in treatment of Hypertension, reduced blood flow to the Heart Cardio Ischemia coronary Heart disease etc. S-Amlodipine is indicated for the treatment of Hypertension & also used for Chronic Stable Angina.